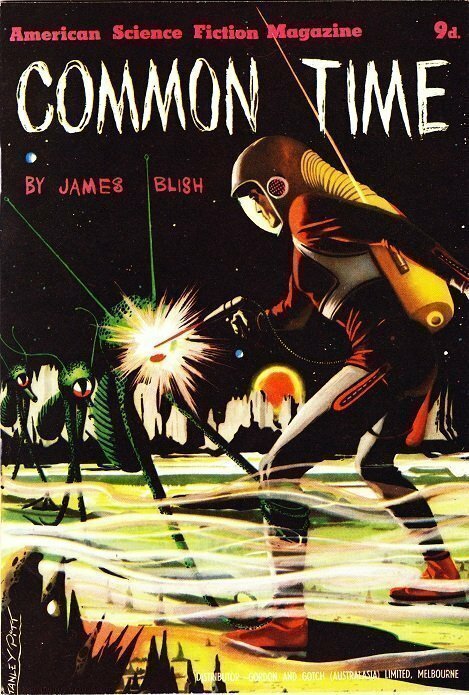 The feature story in this issue of the Australian published American Science Fiction Magazine series is “Common Time” by James Blish. Admittedly a fine science fiction yarn, but bogged down when Blish gets a wee bit technical. I prefer my science fiction to be more escapist than scientifically instructive. Next novelette inside is H. Beam Piper’s “Genesis.” Initially, I feared that Piper would trod the Adam-and-Eve path, but he chose the nearly equally beaten path of humans historically being aliens that came from a doomed planet. A fun read with the usual ending. Shockingly, it is David Grinnell’s “Last Stand of a Grenadier” that entranced me entirely to the point that I refused to drop out until finished. It’s a typically easy read by this writer, alias of Donald A. Wollheim. Here, we have DAW Books founder poking fun at fandom, with a lot of tongue-in-cheek and the consequences of children watching the tube. Far distant aliens have hijacked one specific science fiction show and are stealing their minds while they sleep, calling their number from deep in space to pilot bombs on suicide missions. Only truly “imaginative” members are called to the post and while their bodies do not die, some suffer emotional trauma, develop amnesia, and some even die. In an effort to avoid their number being tapped, two young fans realize the plot and begin a hefty effort to recruit more SF fans. The plan goes awry when more and more kids are taken. Eventually, they will run out of replacement kamikaze pilots, and then, well, you’ll have the last Grenadier….to avoid this fate for his own son, our narrator, a newspaper reporter, unhooks his television set and offers to sell it cheap to any reader, so long as they do not have children…. This issue sports a stunningly gorgeous cover by the ever-competent hand of Australian artist Stanley Pitt. As with some other issues in this AMSF series, this cover has nothing to do with the text inside.